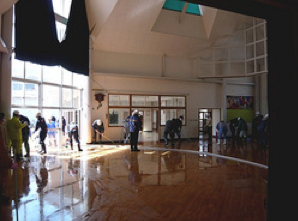 Shanti recently gave assistance to local schools who needed to clean their facilities for the new school year, which started on April 21st. Starting from April 17th, the 100+ volunteers who gathered helped hose down the place, dispose of the unusable dirty material, and collect/return the usable teaching materials to their proper locations. Workers desperately wanted to get this done by the entrance ceremony, where the children would be able to have a fresh start. Also necessary for these students are the proper school supplies, which mostly got lost after the quake. 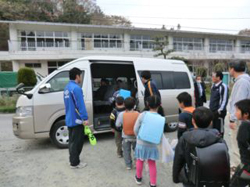 Shanti prepared a “study materials set” including 19 items such as notebooks and pencils, and distributed them to 11 elementary schools in Kesen-numa city to 1764 students total. 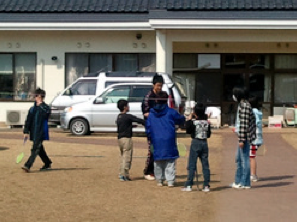 At Matsuiwa elementary school, part of the building continues to be a shelter for those who still do not have homes. 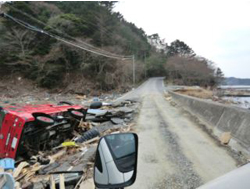 According to a teacher, the tsunami wrecked the houses of 130 of the students. 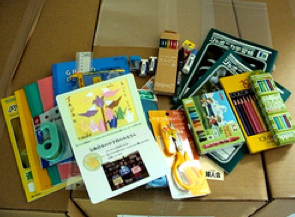 When Shanti gave them the study materials set, a teacher told them “I’m glad these came in time for the new first graders who are entering school this year” while in tears. 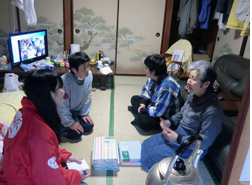 Another issue they raised was the housing situation; although construction for temporary housing has begun from late March, it is difficult to provide enough housing for the people as Kesen-numa city is located in a rocky location between mountains and the sea. Even when shelters are provided, the staff worry that this will decrease the amount of attention given to older and sick people who will not go out of their houses. They want to address the post-move in care that is necessary. One shelter was located at a crematorium, where the staff talked with a fourth grader, Y. He spoke slowly while telling the staff that “A few days ago, we finished cremating my mother and my two younger sisters.” The mother was taken by the waves while working, and cremated on March 30th. His 4 year old sister was cremated the next day, and his other sister who was just about to enter elementary school was also cremated the following day. “Before the earthquake, her new backpack arrived to our house. She was so excited to get all of her supplies from the department store as well” he said, before pausing and adding “But the new backpack, house, and my sister were all washed away.” Although he did mention that “My friend still hasn’t been found after his house washed away”, he was still grateful for his father, who was with him in the shelter, and his grandparents who lived in an unaffected area. AAR has recently set up a bus system using microbuses, as the roads are still not wide enough to accomodate large vehicles. From April 10th, they have started operating a regular bus system, which carries people to the hospital, train stations, schools, and shopping centers. Especially in an area with many older people who cannot move around easily, these rides are valued very much. One 75 year old lady who used the bus said “I was very happy when I heard about these busses on the radio, as I hadn’t been in the city at all since the quake”. AAR also reported on the assistance they provided to the disabled and their families who are currently unable to live in shelters. 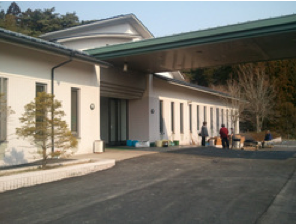 At Ishimaki city, AAR received report of three families with disabled children who were not receiving aid. Due to the nature of their situation, it was hard to live in a communal shelter and thus they moved to this smaller, more private location. It’s hard to provide aid to all people, but these agencies are providing as much assistance as they can, targeting the small but important needs of everyone. Keep supporting them by donating!